District is located on Queen Street East, around two blocks east of Broadview. It occupies the space that formerly housed Woodgreen Fish & Chips. Please read our conversational review, below. 9.0 / 10The best Spicy Tuna roll I have had! Nice decor and dishware; Avoid the Spider roll. 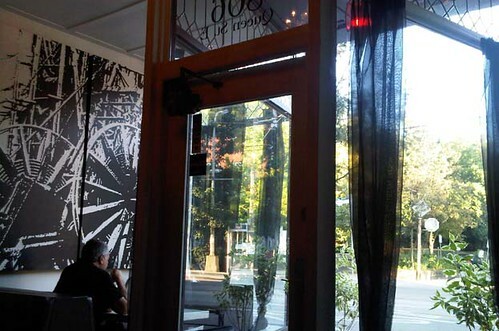 9.0 / 10Unique, cozy little place on a nice stretch of Queen East. Fantastic sushi accompanied by cold draft beer! Stay away from the Spider Roll, however. I found out about District (“Modern Japanese Bistro”) via Groupon. Yes, they had District as their deal of the day, and, after researching online I jumped at it. I really love this section of Queen Street East, stretching from Broadview out until Carlaw or so. There are a lot of nice little neighourhood places to grab a bite or a pint (or both!). We (myself and my friend — our special guest reviewer, making her review debut here on Sushi Toronto) made reservations online via Open Table but it seemed they weren’t required that evening. Inside at District sits maybe 20-25 people (I’m guessing here) but there’s also a patio out back. Upon arrival we were greeted immediately and shown a seat and provided menus. For whatever reason there was a bit of a lag in actually taking our order, which was odd as it wasn’t that busy. Regardless, they had two beers on tap (Sapporo and Sleeman Original Draught) which I especially loved. They came in matching glasses, and nice and cold! I was impressed by the two beers on tap, as well. Although, I thought they were, in fact, too cold. 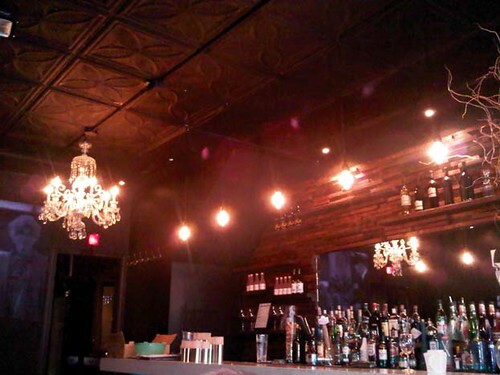 Overall decor of District looked like an upscale drinking place… and someone came in and decided to serve sushi. The only thing ‘Japanese’-looking about it was the sake on the wall by the bar. For the decor, I liked the black painted walls — It’s hard to get away with but it worked well due to the bright paintings that lit it up – and the white painted walls as you first walk in. I also liked the red velvet (I think!) cushions against the black couches. True, the place is a nice, cozy neighbourhood (yet somewhat trendy) beer/dinner spot and definitely does not scream ‘sushi’, but, to be honest, I love this combination. On to the food: We ordered the Ebi Ebi roll (shrimp, avocado, cucumber topped with shrimp and spicy mayo @ $12), Spicy roll (salmon, tuna, cucumber, avocado, tobiko, spicy mayo @ $9), Spider roll (softshell crab, cucumber, kani, avocado, tobiko @ $14) and some sashimi (don’t recall which one) – to accompany our respective pints. Regarding the glassware/dishware: I was very impressed that the chopsticks were not disposable and liked the fact that the red wine comes in a red wine glass (as ordered by the family to our right) and white wine came in a white wine glass (as enjoyed by the couple to our left). The edamame bowls were beautiful and modern… Lots of money was put into the dishware/glassware which you don’t see it a lot of sushi places. It seems they paid attention to small details (except for the closed sign in front of the store, when, of course, it was open!). The soy dishes were nice and small and cute but not really practical. The bottom was too narrow to fit a piece of sushi. This, my dear readers, is the insight you get when you have a female guest reviewer. The regular Sushi Toronto review duo can’t pull that off. Our order arrived, but without one item. After an apology the sashimi came out and with one piece extra, for our waiting. The rolls (and the sashimi) were really really nice. I was impressed. My only real beef was that the Spider roll pieces were so massive they were pretty much impossible to eat without taking them apart. Not exactly delicate sushi eating. 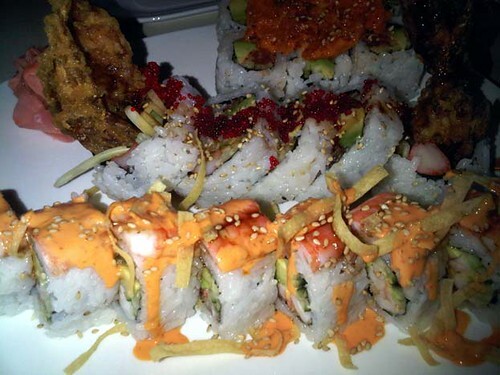 The food was good except Spider roll – for the obvious reasons. The Spicy roll was the best spicy tuna roll I’ve had, and it was actually spicy! The sashimi was fresh and very tender. Yes, the food was fantastic, minus the size of the Spider roll… and I really like a nice beer on tap to go with it. Add in the cozy environment, and District is a winner in my books. I’ll definitely be back — and without a coupon! I’ll gladly pay full price for this sushi dining experience. Service was a bit slow, but it wasn’t that bad. Nine out of ten. I give District a 9/10 overall. Don’t order the Spider roll. Of note, all the food other people had looked a decent size. I went back again the other day. I really (really) love this place. Highly recommend. Spicy Sashimi Salad! — wow, had that at District last night. Reeeeeally good.